Pho is said to be the national dish of Vietnam and popular Vietnamese writer, Vu Bang said “From a great distance one can detect the special aroma of pho which is so alluring that one can’t help but to trace it out. 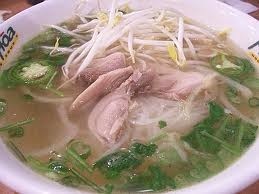 Indeed, to some, pho can be as addictive as opium”. Pho is a rice noodle soup which includes either beef (pho bo) or chicken (pho ga) and is served with Asian basil, rau om, coriander, bean sprouts, thinly sliced onion and lime juice. Pho has its origins in Hanoi where it is a popular street food but this culinary delight has now found its way to every corner of Vietnam and into Cambodia and according to a CNN survey is ranked No.20 of the world’s 50 most delicious foods. There are tens of thousands of restaurants and food stalls in Ho Chi Minh City alone and I have had so many people tell me where to find the best Pho Ga in Vietnam. But to me, it is a matter of “Who makes bad Pho Ga?”. Really, it is sensational everywhere. I have found delicious Pho Ga sold on the streets and in the narrow alleys of the suburbs. I was riding my motorcycle back from Vung Tau to Ho Chi Minh City and stopped in Long An for a bite to eat at a roadside restaurant. I was starving and a little worse for wear after enduring Highway 51 for the previous 2 hours. I ordered my favourite food, Pho Ga. It was the best. The noodles are put into a colander which is dunked into a huge pot of broth kept hot on the stove. After heating the noodles they are added to a large bowl with some chicken meat. The broth is ladled from the pot and the herbs, bean sprouts and lime are served on a separate plate to be added by the customer. This meal cost me less than a dollar in Long An and I began to think where or if I had tasted better Pho Ga. Perhaps they are slightly different from place to place but I am now convinced that it doesn’t matter. It is good everywhere.